Heat oven to 325°F. Spread 1 tablespoon melted butter in jelly roll pan, 15 1/2x10 1/2x1 inch. Mix brown sugar, corn syrup, 1/4 cup butter and the salt in 3-quart saucepan. Heat over medium heat about 5 minutes, stirring constantly, until brown sugar is dissolved; remove from heat. Stir in cereal, pecans and almonds until well coated. Spread mixture in pan. Bake uncovered 15 minutes. Cool 10 minutes. Loosen mixture with metal spatula. Let stand about 1 hour or until firm. Break into pieces. Store in airtight container. Did you know you can freeze this snack in airtight containers up to 2 weeks? You can also store it tightly covered at room temperature for the same time. 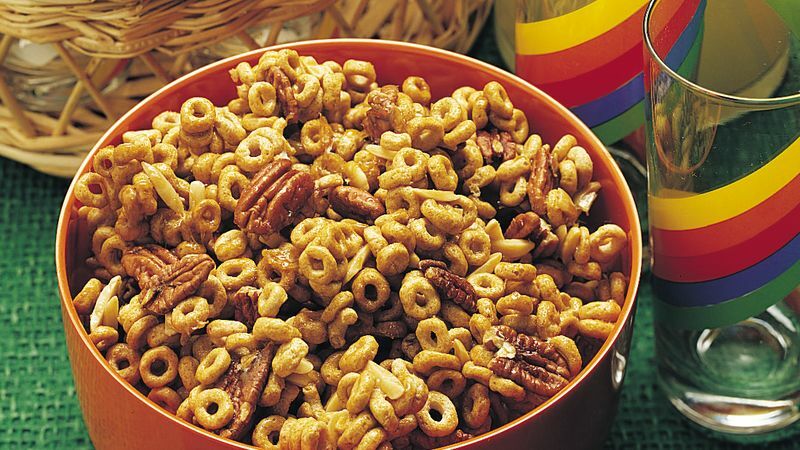 Serve this snack mix in individual brightly colored party cups, tinted cellophane bags or a big, colorful bowl. Not fond of nuts? Try tossing corn or wheat nuts into the mixture. Or you could use 1 cup of mixed dried fruit instead.